In 1942, the US Book Republication Program (BRP) allowed US publishers to reprint exact copies of German-owned science books, effectively breaking the monopoly power of copyrights. An immediate effect was a 25% decline in the price of the average BRP book. We use this change to examine the influence of copyrights and access costs on science. We start by examining changes in the number of new books and articles that cite BRP books after 1942. Baseline estimates compare changes in citations tothe same BRP bookfrom English-language authors (who benefitted directly from the US-based BRP) with citations from other-language authors, who did not benefit directly. This identification approach addresses selection issues by comparing citations to the same book. OLS estimates indicate an additional 80% increase in citations to BRP books from English-language authors after 1942, compared with other authors. A complementary identification strategy compares English-language citations to BRP books with English-language citations to Swiss books. This approach addresses the issue that English-language citations may have increased mechanically after 1942, if English-language scientists published more after the war. Like German scientists, Swiss scientists were leaders in chemistry and mathematics and wrote primarily in German, but due to Switzerland’s neutrality, Swiss-owned copyrights were not accessible to the BRP. 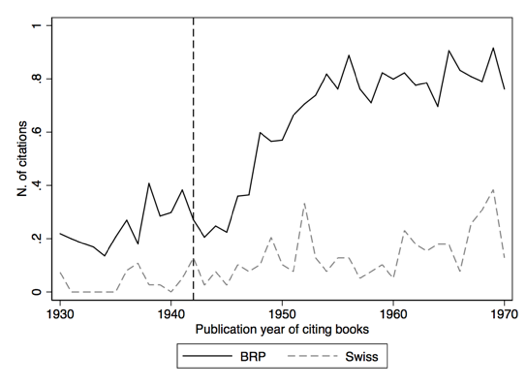 OLS estimates of a matched sample of BRP and Swiss books (in similar fields and with similar levels of pre-BRP non-English citations) confirm the significant increase in citations in response to the BRP. We also combine the two identification strategies, by comparing changes in citations to BRP books from English-language and other authors with the corresponding changes for Swiss books. These estimates, which are our preferred estimates, imply a 67% increase in citations. Notes: Citations for a matched sample of 214 BRP books and 39 Swiss books. Books are matched with a Mahalanobis propensity score procedure using research fields and the stock of pre-1942 non-English citations as matching variables. One of the key advantages of this empirical setting is that we can observe the effects of a change in price for the same book under different copyright regimes. Before the BRP, the average BRP book sold for $43, equivalent to$1,360.00 in 2016.1 Under the BRP, US publishers sold the same book for 25% less. Intensity regressions show that this decline in price was a major contributor to the effects of the BRP – each 10% decline in price of a BRP book is associated with 38% additional citations by English-language authors. We can also investigate effects across disciplines. Intuitively, copyrights should matter more in disciplines that are less dependent on physical capital. If a mathematician gains access to a new set of research results, she can use them in her research with little more than a pen and paper. A chemist, however, is more likely to need access to physical capital, for example in the form of laboratory space and equipment to complete new work. Our estimates confirm this prediction, and show that reductions in price led to significant additional increases in new work in mathematics compared with chemistry. To delve more deeply into the mechanisms by which reduced access costs increase citations, we examine differences in library holdings for BRP and Swiss books. This analysis suggests that the BRP increased citations by allowing a new group of libraries to purchase German-owned books. BRP books entered the holdings of a geographically and economically diverse set of US libraries, whereas comparable Swiss books remained concentrated in the holdings of two wealthy research libraries (Yale and Chicago). In fact, an analysis of lending cards (which are attached to the back of library books) shows that scientists in the US began to use BRP books around 1946, four years after the BRP. These patterns closely match the timing of the increase in citations that we observe in the main analysis. We also show that citations increased most near the locations of BRP libraries. These estimates attenuate with increasing distance from BRP books. Importantly, pre-trends in citations are comparable for nearby and distant locations. A final set of tests examines two alternatives measures for changes in follow-on science: new PhDs in mathematics, and US patents that use knowledge in BRP books. Data on PhDs confirm the expansion in the geographic scope. An analysis of US patents indicates a 15% increase in patents that utilise BRP books. Notably, there are also no observable differences in the pre-trends of PhD theses or US patents across locations. We conclude that lenient copyrights have helped to encourage American science by facilitating access to foreign-owned knowledge. Reductions in price were a key channel for this effect. Lower book prices allowed less affluent libraries – and nearby scientists – to access new knowledge and use that knowledge in their own research. In the context of contemporary debates, our findings imply that policies which strengthen copyrights, such as extensions in copyright length, can create enormous welfare costs by discouraging follow-on science, especially among less affluent institutions and scientists. Biasi, B and P Moser (2018), “Effects of copyrights on science: Evidence from the US Book Republication Program”, NBER Working Paper 24255. Scotchmer, S (1991), “Standing on the shoulders of giants: Cumulative research and the patent law”, The Journal of Economic Perspectives 5(1): 29–41. Using real wage conversions, based on the unskilled wage, as a conservative estimate (Williamson 2016).